ETA Apr 2010: August, HA! Amazon delivered my copies this weekend! (Yes, plural. One for me, and one for my mother, and one for....)ETA Mar 2010: This book is coming back into print! Amazon has it listed as available for pre-order, scheduled to be released in August 2010. Say it with me now: Yaaaaaay!Original ReviewWhen I was very little, this was one of my favorite books. The cover has been loved completely off of my copy, and every page has crayon scribbles (although I don't recall if it was me that made them /sideways glance at younger brother). I've tried to find another copy in better condition, but it's been out of print for the better part of twenty years and the prices of used copies are astronomical. Pity! It should come back! I stumbled upon this book while reading a book blog. This is such a fun book to read. Quite a bit of the story is in rhyme. The illustrations are awesome. Looks like the illustrator did looks of work for Disney and the book shows off his illustrations.The book is about all the children and parents in this village who fall asleep and when they awake, all the mothers are getting ready to bake their Christmas cookies. But while they were sleeping the Sprinkle snitcher stole all the sprinkles. One little boy named Nate decides it is up to him to track down this snitch and find all the sprinkles. Because after all, what kind of Christmas cookie is one without sprinkles?I can't believe I had never read this book before. My five year old and I loved it and I will read it every year and hope to share it with other children while substitute teaching for the holidays. Young and old will enjoy this book. This was my FAVORITE Christmas book when I was younger. The copy I had was so tattered and worn and falling apart I was thrilled while browsing Amazon a couple weeks ago to find it had been re-released. I was so excited when a new hard bound copy came in the mail last week.The story has similarities to How the Grinch Stole Christmas and makes a great read aloud. At my children's elementary school the teachers ask parents to come in to read a Christmas Story and I chose this one. Paired with a plate of sprinkle covered Christmas Cookies it was a big hit.I still love the illustrations and the rhyming text. A definite Christmas classic that has withstood the test of time. This children's book was out-of-print until this year, but now that it is no longer the rare and extremely expensive book it once was, I urge everybody out there to go buy a copy of this book. My two 1969 paperback copies are probably not worth much now that it's been reprinted, but I don't care. It's more important to me that this book is accessible to all! Buy it for your children or for yourself. It has delightful illustrations and a fun story that enchanted me as a child. It is definitely one of my favorite children's books of all time, and I am a collector of children's books from all eras! This is one of the books I loved to read to my 3 kids the very most. It is a very entertaining Christmas story involving a town that had been robbed of all of it's Christmas cookie "sprinkles"...right before the holidays no less :-(. I think it is very hard to put your hands on a copy at this point...but if anyone ever sees one...I would love to have it! This was one of my favorite books as a kid and Ia m lucky enough to still have my original copy. It is now a favorite with my kids too. An adorable Christmas story all in rhyming and with a great message to spread sprinks to the needy. Loved using it every year with my 5 year olds...so glad it has come back in print. I loved the illustrations in this book. They were full of color and whimsy. So fun and the caper that must be solved is super funny for kids! This is absolutely one of the best christmas books ever! A classic that was just reissued. Such a fun and unique Christmas story. Super enjoyable. Several kids on my list are getting this as an early Christmas gift this year. My very favorite book ever! I have an original hardbound copy that I got when I was little. I read it to all the kids every year at Christmas. A great book to read to young children at this time of year. My grandson loved it. I'm sure we will be reading it again and again! A perfect story for my sisters and I to read together. I was a little silly, yet of course it's what they loved about it. lol Also though at the same time it sent a good message, that my little siblings immediately understood and learned from. One of the kids' favorites. Similar to "the Grinch" storyline, but with cookie sprinkles trailing across the pages. This is one of my favorite books now and from my childhood! I still have my own copy. 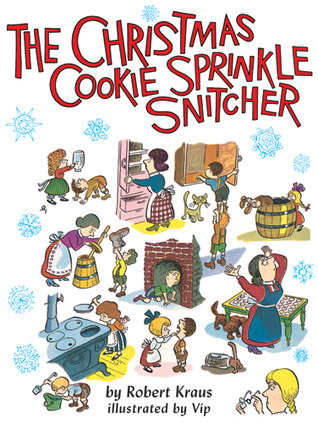 Cute story about a thief who steals only the sprinkles off of all the Christmas cookies. Stealing all the sprinkles? Dastardly! What's a Christmas cookie without sprinkles? Why, it's Christmas without the joy!This didn't live up to the expectations I had built up after reading reviews, but is still fun and I think kids will like it. Everybody knows, there's just something special about sprinkles! A delightful romp! Charming tale extolling the virtues of cookie sprinkles (as important, Kraus notes, as a raisin's wrinkles or a sleigh bell's tinkles.) The story is similar to Seuss's Grinch, a youngster befriends the town outcast who ends up saving Christmas. Fun illustrations, reminiscent of Bil Keane's Family Circle comic strip. Ever so much fun. My sister got it for my niece and they brought it over so that I could see it tonight. It's a reprint of a '69 title. I LOVE the illustrations. Most (not quite all, though) of the rhymes work very well. Sort of like the Grinch the Snitch learns his lesson. It is better to give and share than take. I first read this when I was working as a page at Schlow Library. I loved it then and wanted a copy to read to my kids. Unfortunately by the time we had kids, the book was out-of-print. I later found a used copy. This book seems pretty popular but it just seemed weird to me. This year was the first time I'd heard of it. I came across it randomly looking for highly reviewed Christmas books on Amazon for 4-10 year olds. What a fun read! I think I enjoyed it as much as my 5 yr old son. I wanted to like this book, but ugh...I hated it. It's a picture book, it takes like thirty seconds for an adult to read, and I still had to force myself to finish it because it was so blah. Such a strange (and dated) book. Why on earth is the sprinkle snitcher some weird turkey/human hybrid?! Nat confronts the Christmas Cookie Sprinkle Snitcher and saves the village Christmas celebration.